KINSHO premium photo albums honor the Japanese tradition of hand made books using archival papers, distinctive cloth covers, and colors inspired by nature. 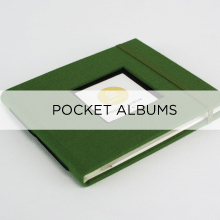 KINSHO Photo Journals are expandable photo albums with scrapbook style pages, while KINSHO Bound Albums and Pocket Albums offer handsome book-bound spines and clear photo sleeves for easy loading. KINSHO is a registered trademark of Art Supply Enterprises, Inc.